Greetings one last time from the Bulgarian capital! Today is our last day in Sofia before moving on. It’s been a short but memorable time in Bulgaria and we’ve managed to make the most of it. One of the real highlights has been the food. More specifically, three knockout dinners in a row at three different restaurants in Sofia- all a short walk from our hostel. Last night, we ended up at a bistro named Lubimoto which had recently received, of all things, a write-up in the New York Times. Man, what a meal! Run by a trio of brothers, a dinner at Lubimoto allowed us to sit outside and pace ourselves over a nice long meal. One of the brothers had spent considerable time in America and doubled as our host (so much more than a waiter) for the evening. We finally relented and began the meal like Bulgarians do -with Rakia! A clear, potent, traditional aperitif that tastes like some devilish mix of paint thinner, jet fuel and bad whiskey. Okay, it’s a bit more palatable than that, but it is certainly an eye-opening way to start any meal. From there, we enjoyed another local staple that’s become a fast favorite and a daily must of ours: A shopska salad. After that, our host brought us two made-to-order entrees that were out of this world. One pork dish and one chicken dish that I would only shame if I attempted to describe the deliciousness. Brooke is calling it one of the best meals on the trip and I’m inclined to agree. A couple of pints of Staropramen and a dessert of cake and pecan ice cream (compliments of our host) rounded out the evening. And the final bill left us wondering if the printer was broken or someone sliced off a few zeros. Great stuff, but not an isolated incident! We also had tasty meals at Divaka and Izbata where we dined among locals, had some Bulgarian dishes and walked away with our Leva (Bulgarian currency) in tact. In summary, great eating in Sofia! Today we took some time to do what Brooke and I do best: Take our own self guided tour of the city. We managed to catch the very cool changing of the guards outside the presidential palace. Impressive pomp and circumstance that happens every hour on the hour. We stumbled into the former Royal Palace turned Art Museum and while we were in the city center, we found ourselves next to a loud (but organized) protest march. Again, we had no idea what they were marching against, until one of the participants came running up to us pointing and shouting at our plastic bag that contained today’s souvenirs. We later learned that it was a march for the government to take more action on environmental concerns and, you guessed it, ban all plastic bags. Not far from the museum, there was an outdoor market selling communist era medals, clocks, clothing and more. You get the impression that when the socialist era ended, a lot of these “collectibles” were left behind. We visited two of the more noteworthy and historic churches in Sofia including a massive Russian Orthodox Church and the church for which Sofia gets its name. So far, no shortage of churches (and statues! So many statues!) in Europe, but each one has grandeur, individual detail and a stunning, peaceful quality that makes it worth the visit. 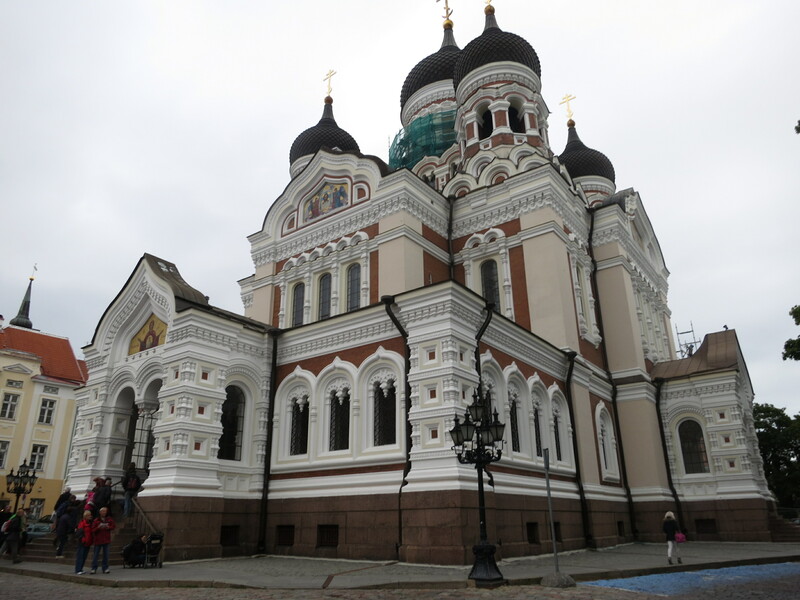 I’ve learned that I prefer the Lutheran cathedral – so many of the Russian Orthodox churches are magnificent and stunning, especially from the outside, but are dark, uninviting and cavernous sterile places of worship on the inside. Just my opinion though. So, as we wrap up our few days in Sofia, we’re ready to say goodbye to the sensational weather, street side cafes, friendly faces and move on. Tomorrow morning, we take two buses a combined six hours to Belgrade, Serbia. The rest of our time in Europe includes stops in Budapest, Dubrovnik, Munich and then a 10 day stay in Scotland and England. Can’t wait for what’s next! Brooke with Morning Coffee and the changing of the guards. This might be my new favorite photo! For reasons we never quite understood, some of the Sofia police cars were Audis and BMWs. Nice. Again, we apologize for the intermittent posting. Wi-fi is limited and absurdly expensive on the cruise ship, so we’re only able to post whilst at port. Salutations from Tallinn, Estonia! 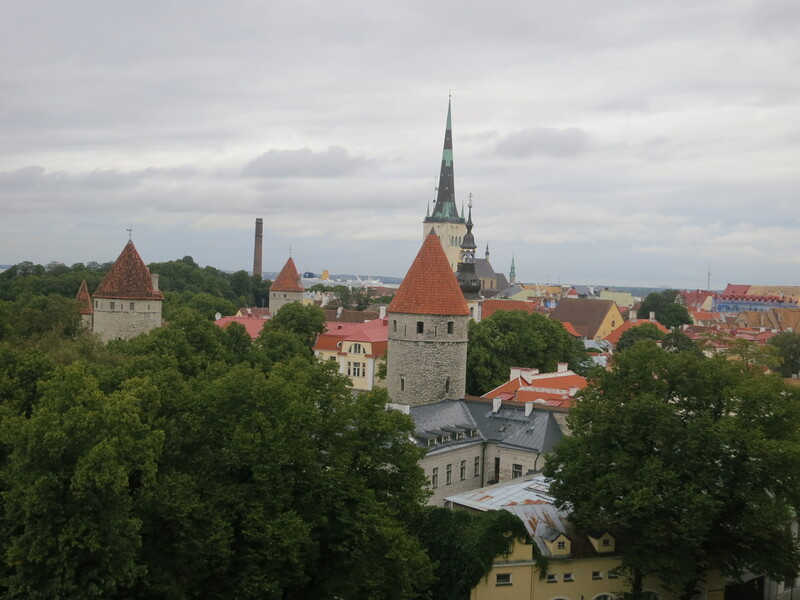 As our epic Baltic Capitals cruise continues to sail across Northern Europe, we docked in Tallinn and spent the better part of today in Estonia’s biggest city situated smack dab on the coast. Our oh-so luxurious and comfortable boat was only in port from about 9:30 AM to 5:00 PM, so we endeavored to make the best use of our short time. 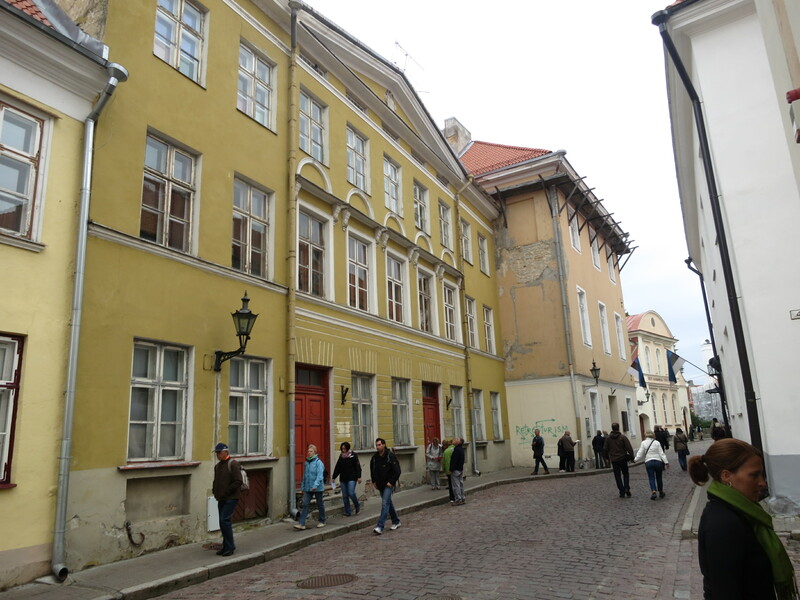 Tallinn is yet another city that we knew virtually nothing about prior to visiting. Our trip has been extraordinary in helping us fill in these giant gaps of knowledge we have about a ton of places around the world like Estonia, Singapore, Vietnam, etc. Tallinn is one of the smallest cities in one of the smallest countries that we’ve spent time in thus far. The entire nation has a population shy of two million. It doesn’t take long to discover that due to it’s small size and “favorable geographic location”, this is a country that has been invaded, occupied and controlled throughout its history by nearly every major European nation including Sweden, Denmark, Germany and, most recently and most notably, Russia. The more we see of Europe, the more it dawns on us how the history of these European nations is so intertwined. Estonian is the local language, but you won’t hear it much outside of the country. It’s unique to be in the midst of a language that only 1.5 million people speak among millions of Europeans. A large part of Estonia’s history involves being resilient while fighting seemingly endless oppression by much larger nations. In fact, in the last 800 years, Estonia has only had 40 total years of true independence! And twenty of those years have been since 1991. That’s crazy to wrap your head around. The country continues to grow on its own two legs and recently joined the E.U. and converted to the Euro just two years ago. Our lunch bill had the price in both the old Estonian currency and in Euros since locals are still adjusting to the conversions. In some ways, Brooke and I were exploring an entirely new nation comprised of a centuries old culture and people. We’re seeing parts of the world in a changing time with some counties experiencing independence and peace only in recent years. 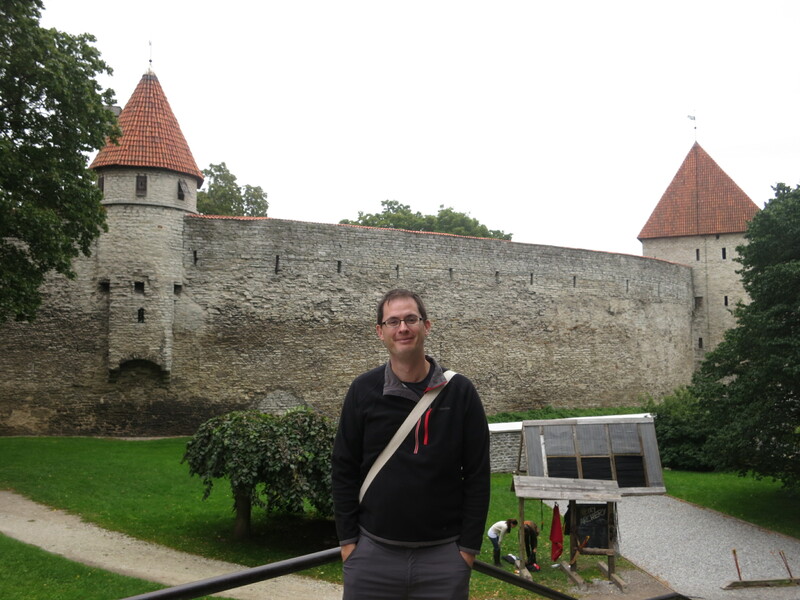 Estonia has a remarkable story and it is a remarkable time to for us to visit. Once again, the ever-present Hop-on Hop-off tour bus served us incredibly well. We’re on the cusp of writing personal endorsements for these buses. When we only have a short time to dig in and see a city, these double-deckers are perfect. For just ten Euro a pop, we enjoyed a guided ride on two different lines covering a solid chunk of the city. Plus, the bus provided transportation to and from to the cruise port. 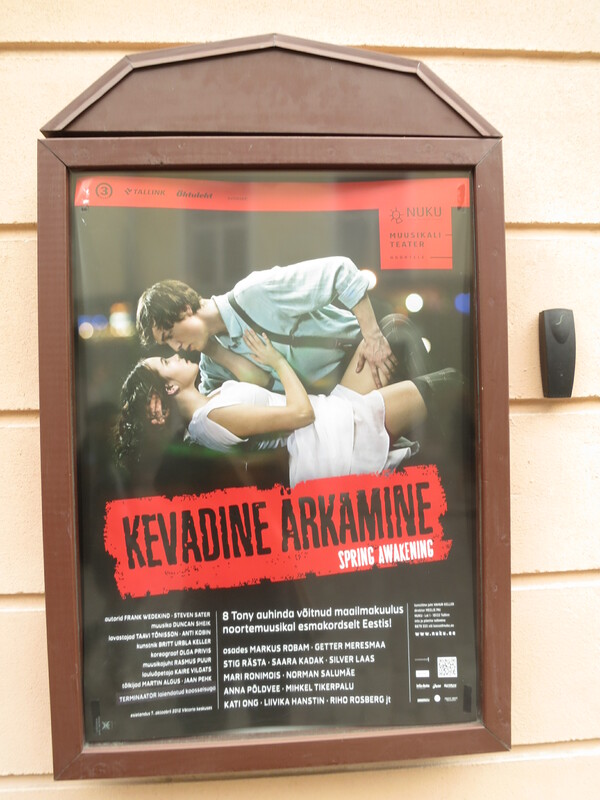 We learned about the Estonian singing culture and their giant outdoor amphitheatre that can accommodate thousands of singers (Estonians apparently love to sing), Tallinn’s role in hosting water sports on the Baltic during the 1980 Moscow Olympics, and we got a good look at a scary looking seaside prison turned museum. Since our Norwegian Sun was one of four, count ’em four, giant cruise boats clamoring for space in the port, our first sight in Old Town was tourists and more tourists. At first impressions, you might think that Tallinn’s main population is nothing more than confused looking middle-aged tourists with cameras and fanny packs. We explored old town for a bit which was made up mainly of beautiful old preserved buildings and churches and surrounded by an ancient wall that has large parts still in tact. Old Town itself has an authentic Medieval look and is quiet, sterile and only used now for historically preserved buildings, government buildings and souvenir shops. Wandering away from the crowds and down the hill, we ambled around the corner and we discovered this great Army-Navy Antique Store. 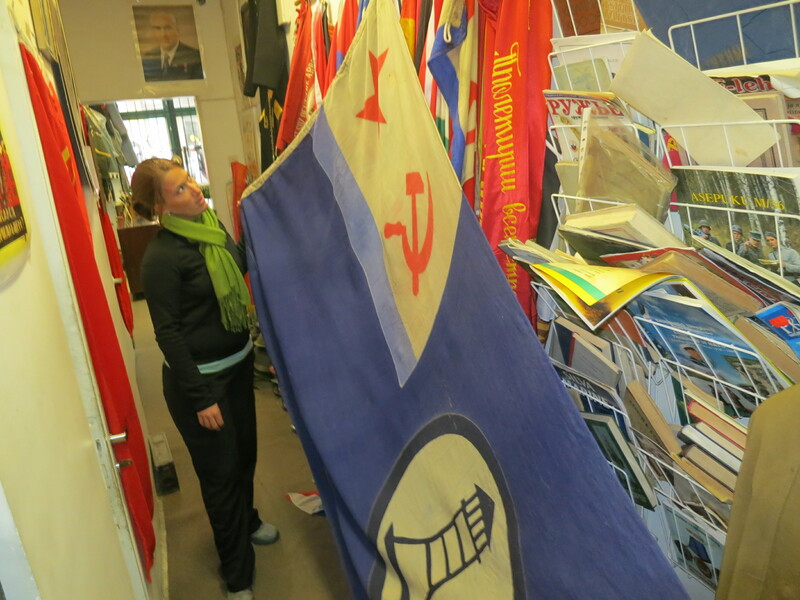 The place was a wonderful mix of antique store and history museum with Soviet and Nazi era flags, metals, propoganda posters, busts of Lenin, Matchbooks and more. Just around the corner, the Estonian History museum was one of the best we’ve seen on this trip so far. The small but mighty museum included an exhibit on a recently merchant’s chest dating from 1350 which was unearthed from the Baltic Sea just last year. The museum also has a very entertaining, tongue-in-cheek video that gives a colorful, brief informative history of the country. On top of all that, the museum has a bathroom that talks to you. I’m pretty sure the toilet was trying to teach me Estonian one word at a time. It was a little creepy at first. Around 5:00 PM, Brooke and I marched proudly back onto the boat satisfied with the job we had done. We hit the city hard and fast. Our reward? A quick history and taste of Estonia. Today was a good day: spending half the day exploring a brand new country in Estonia and the other half keeping busy on our giant boat. Speaking of our time on this massive rig, cruise living continues to treat us very well! We’re meeting friendly (mostly American) new faces around every new corner, kicking tail and taking names at trivia (particularly Name that Tune Movie Trivia) and we even managed to catch a Sunday Night NFL game which was pumped in live via Satellite late night in the Sports Bar. The food has been sensational in the categories of taste, availability and quantity. And running on the treadmill is a much more inspiring activity when the view from your window is the moving, open sea. Tonight was a delicious dinner with an ocean view in the main dining room, enjoying a live version of Deal or No Deal, watching a group of shipboard singers and dancers plow their way through Broadway Show tunes, and enjoying some more good luck in the Casino. Hmmm…is it too early to look into a fifteen day cruise? Next stop: St. Petersburg! One last image of some of Old Town from high above. The big church in the background doubled as beacon for sailors and has burned down like five times. In order for us to quit our jobs and travel the world for almost four months we had to be very budget conscious. We write down everything we spend, we set limits to our spending and shoot for cheap accommodations whenever possible. 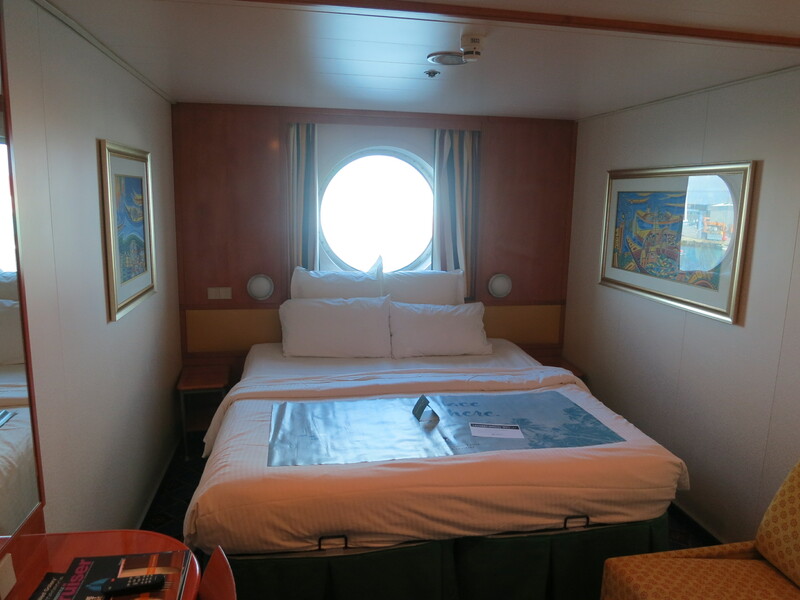 We have now embarked on the most luxurious part of our trip: a cruise! That’s right, we are currently sailing the Baltic Sea. Three square meals a day, anytime of day. Workout facilities. More activities and entertainment than you can imagine. But most importantly, this cruise has allowed us to unpack our bags and turn our stateroom into our home for the next nine days. Nine nights in the same bed–a king sized bed. We are thrilled! 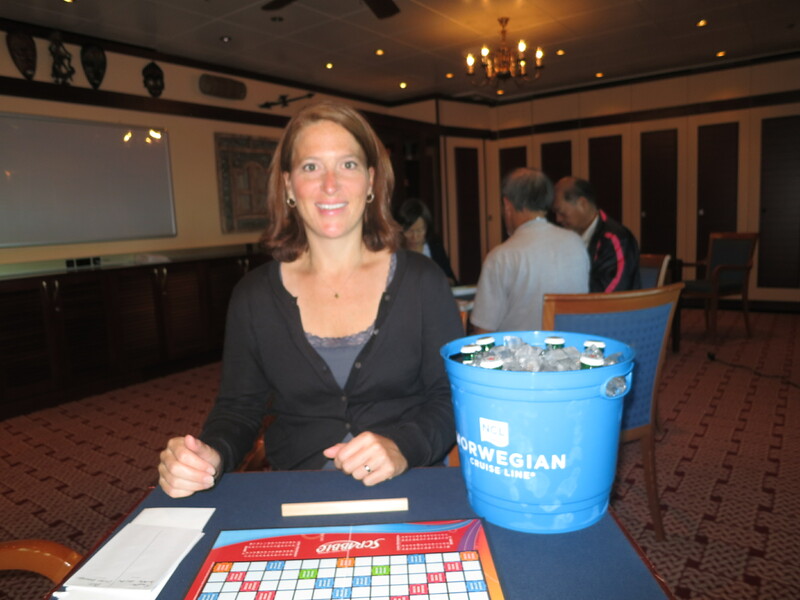 Our cruise left from Copenhagen heading to our first stop, Warnemünde, Germany. Never heard of it? Neither has anyone else. It is a small seaside town which is popular with locals during the summer and caters to cruise ships which frequently dock there. It is approximately a three hour ride in each direction from Berlin by train, so some people on the ship went to the German capital for the day. While this sounds great, traveling that much makes for a very long day. 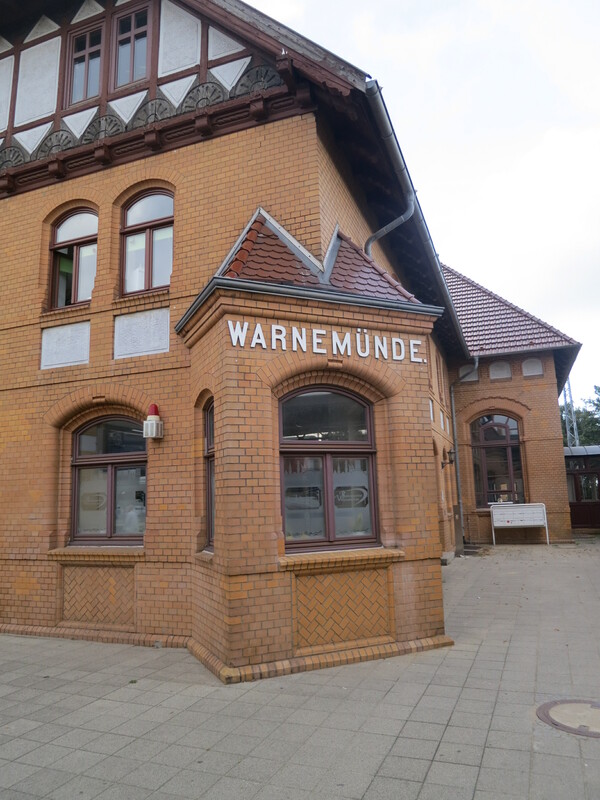 After seeing that Frommer’s Travel Guide has less than two pages worth of material on Warnemünde, we decided to spend a very small bit of time scoping it out, and then take the regional rail to nearby Rostock. 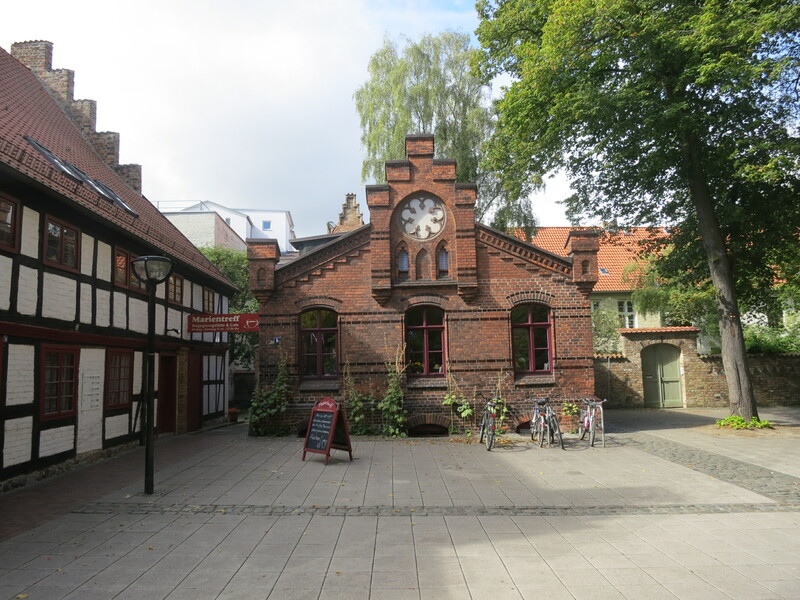 As with so many cities in Europe, Rostock has a very old feeling to it. We didn’t know much about the town and figured we would discover things as we went. As soon as we got off the train we spotted an old church in the center of town. It was definitely our find of the day. St. Mary’s Church was built in the 1200’s. It is beautiful and grand, and the best part is that it is still in use today. At the entrance to the church they make it clear that it is not museum, but a place of worship. They were fine with people walking around and taking pictures. There was an exhibit about the life of Jews in Germany from 1933-1945. It was all in German, but we got the gist We were even able to listen in on an orchestra practicing for an upcoming concert. The music filled the church and provided the perfect background for us. 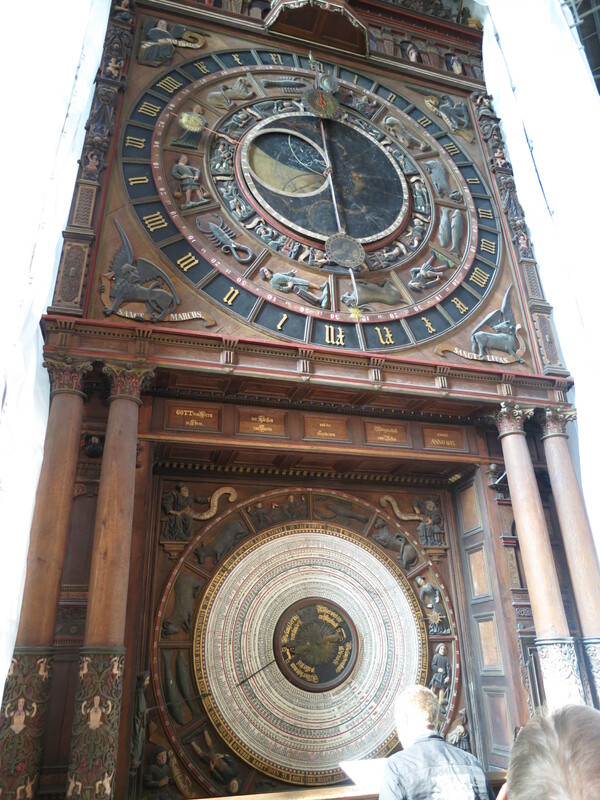 However, the biggest draw to St. Mary’s Church is its giant astronomical clock. This clock does more than just tell the time of day, it also gives the day, month, year, moon phase, and zodiac sign. What more could you possibly need? Over 400 years old, this clock is still wound by hand each day. At noon each day there is a procession of the Apostles on the clock (sadly, we missed that). The current dial only goes to 2017, however they will be able to replace that when the time comes. The only thing that wasn’t accounted for when the clock was originally built was daylight savings time. Twice a year they have to account for this time change. 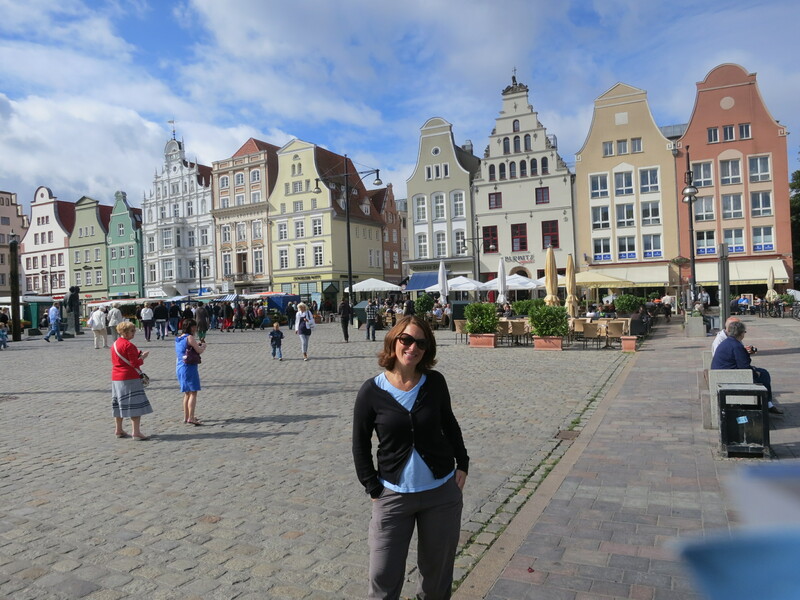 We wandered around Rostock a bit more, watched kids play in the fountain and absorbed all the sights, sounds and smells of this small town. 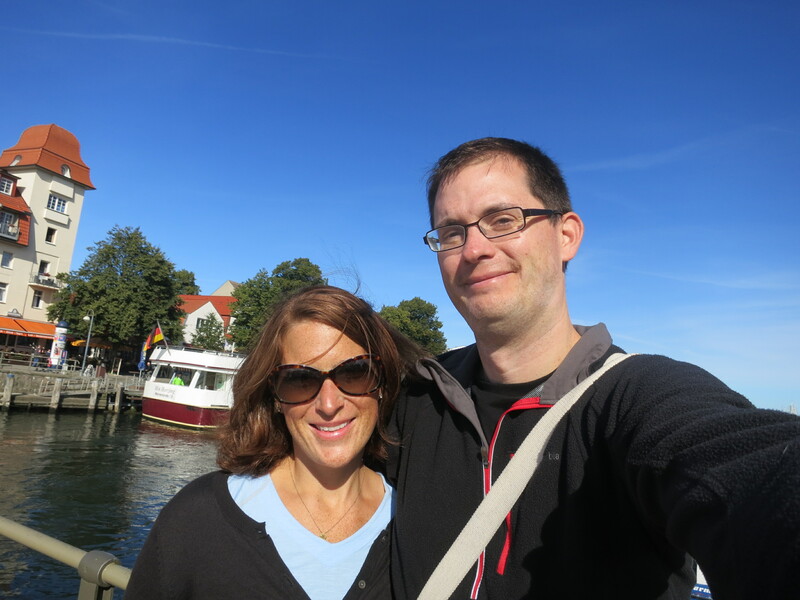 When it was time to head back to the boat, we opted against taking the short train ride back to Warnemünde and instead we chose to take a ferry up the river. 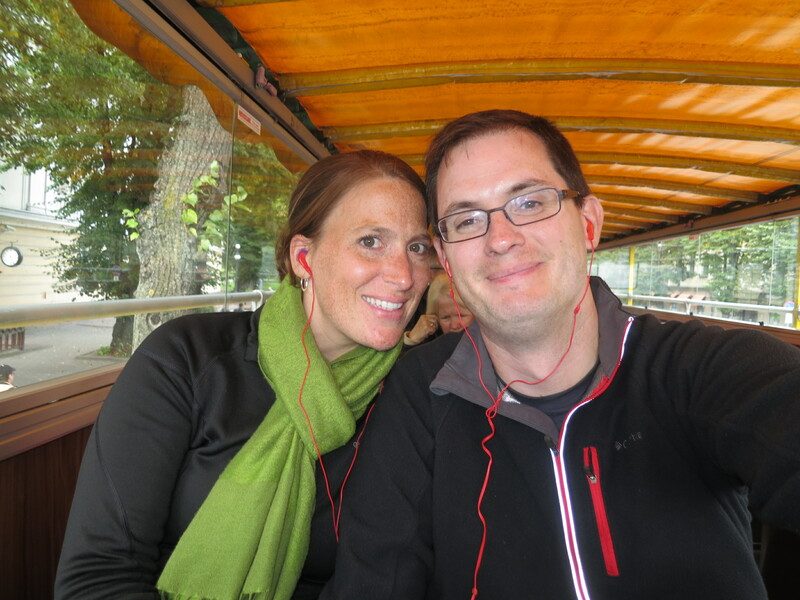 We soon realized the ride was a cross between a sight-seeing tour (all in German) and a booze cruise. Since we couldn’t figure out if the drinks were part of the ticket or not, we abstained. All the Germans on board seemed to be having a marvelous time, shouting at other boats and toasting to their own happiness. The ferry helped demonstrate what a busy port both Rostock and Warnemünde really are. There were tons of ships–not cruise boats, but ferry’s, cargo boats and even some decommissioned military vessels. It was a great way to see these two cities from a new perspective. Our time in both Warnemünde and Rostock was limited, but we don’t feel too bad about it since we will be back in Germany later on in our trip. Actually, we were eager to get back to the boat and our life of luxury. We ate delicious food, did terribly at some very difficult trivia and played some $5.00 Blackjack. Because it was my birthday, the casino bought a round of drinks fo the whole table and gave me a $25.00 chip to bet. Sadly I lost that hand, but we were ahead in winnings quite a bit by the time we walked out, so that always makes it more fun. We could definitely get used to this cruising lifestyle. Our room gets made up 2 or 3 times a day. The casino is never far away. There is wonderful entertainment: last night we listened to one of the onboard entertainers do a set of Neil Diamond covers. He’s so good! He really does sound like Neil Diamond, gravelly voice and all. Besides the entertainment, we find that we are simply having a blast! 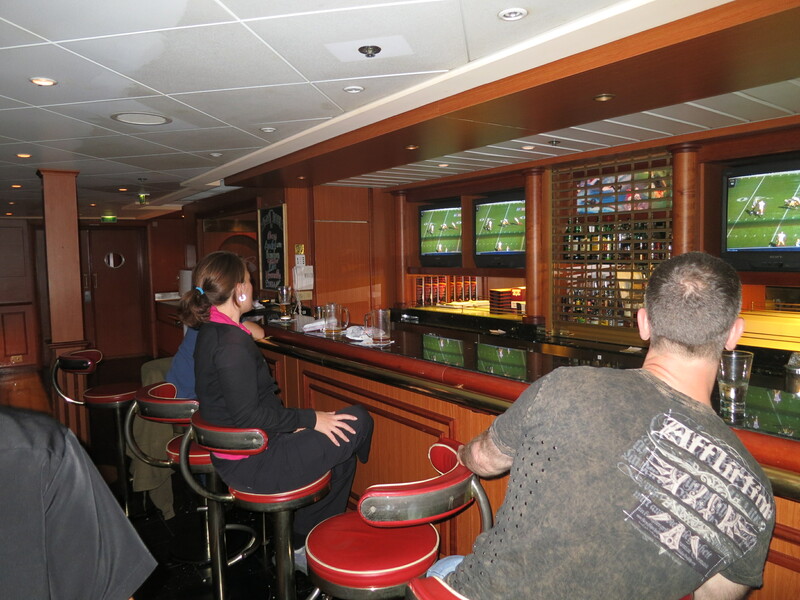 On the days when we are at sea, it is like mandatory relaxation. There is no pressure to make the most of our time or to see as much as we can. It has been a nice change of pace. Our next stop is Tallin, Estonia and then we head on to St. Petersburg, Russia. We are incredibly excited about both of these stops and can’t wait to share them with you. 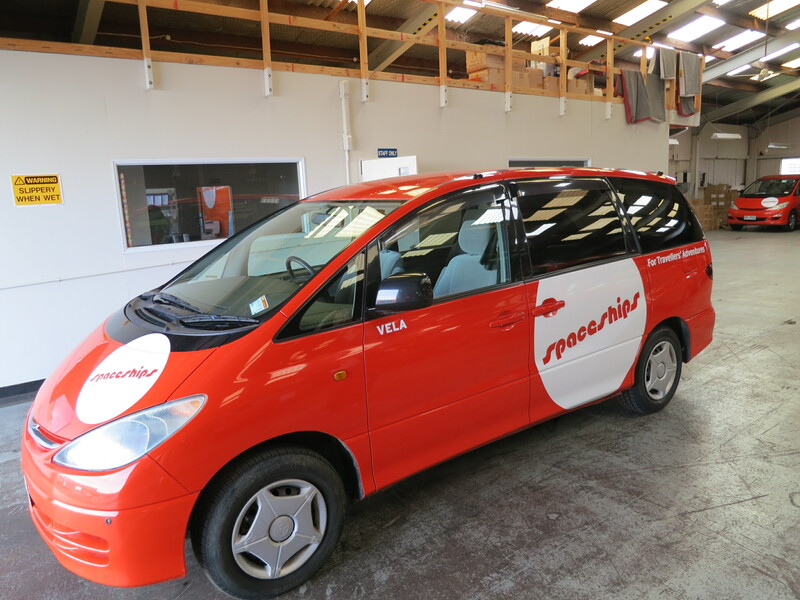 When planning our trip to New Zealand, we knew we would probably have to rent a car. Our research showed us that Kiwis rely heavily on driving, and public transportation options are limited outside of the larger cities. Since we are traveling on a budget, we didn’t want to spend exorbitant amounts on a car rental, so we looked through all the brochures we had and then discovered: Spaceships! You may or may not know that campers and campervans are very popular in both New Zealand and Australia. 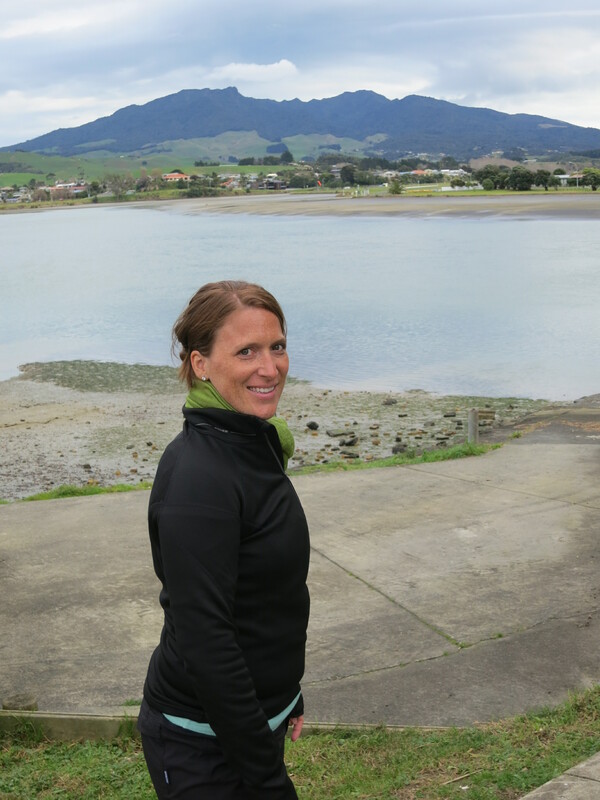 Lots of people who travel are looking for outdoor adventure and these provide that flexibility. The Spaceship considers itself the Swiss Army Knife of campervans. Housed in a Toyota minivan is our daily transportation as well as our nightly accomodations, if we so desire. There is a double bed complete with linens, a small refrigerator and cookstove, pots and pans and a DVD player and screen. The back of the van opens up and can be covered with a tent to provide more space. There is also an awning that can be put up on the passenger side door to provide shade. It is pretty awesome. Are we now planning to camp every night? Not necessarily. 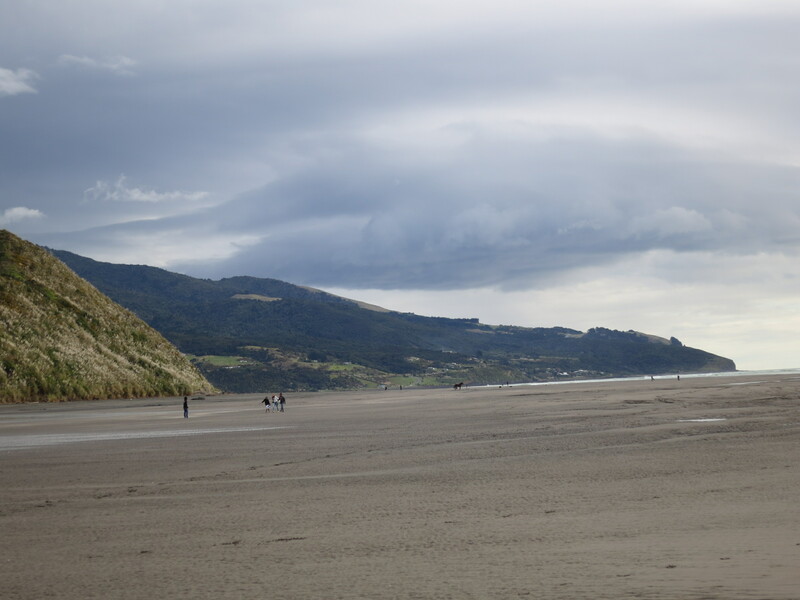 But campgrounds are in abundance here and it is nice to know that option is available to us. It is also a major bonus that we are in the off season: the Spaceship was by far the most affordable car rental we found at $29 NZD a day. 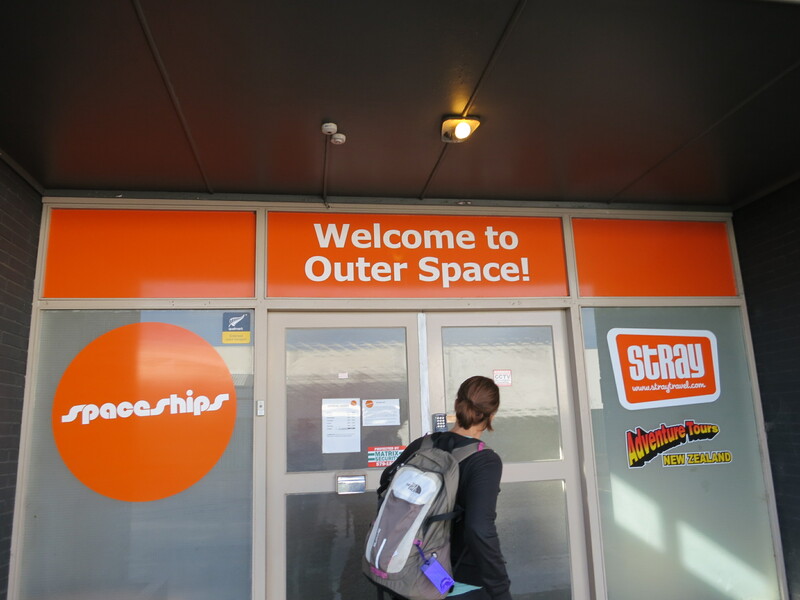 Once we picked up our Spaceship named Vela, we continued out of Auckland and began our journey south. This seems simple enough, except they drive on the left side of the road here and the steering wheel is on the right hand side of the car. It doesn’t seem like this would be that hard, but suddenly turning left and right takes a lot of thinking first. Luckily, Phil agreed to be our inaugural driver. He really did an awesome job, though he occasionally veered a little too close to the edge of the road. I can’t blame him–everything is so different. Merging traffic comes in from the left, you pass slow cars on the right. Turn signal is on the right of the steering wheel, windsheild wipers on the left. 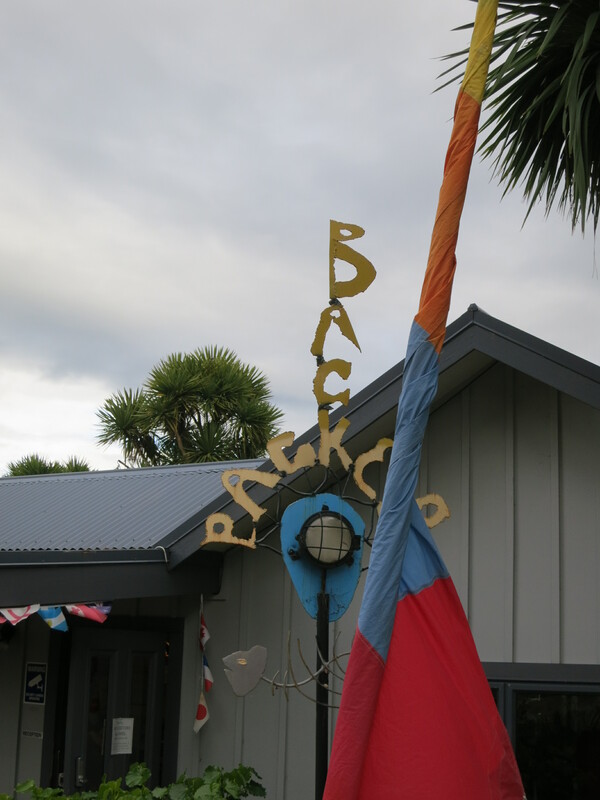 It didn’t help that we were taking some crazy, winding roads to get to Raglan, today’s destination. It felt a bit treacherous at points, and when we saw a car had flipped on its side after taking sharp turn around the hills, we decided we should definitely be a bit more cautious and watch our speed. 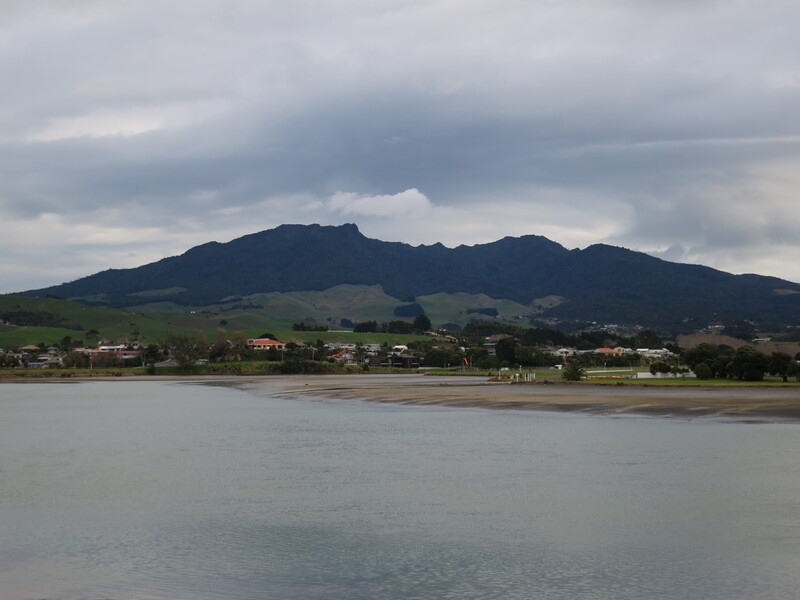 Luckily, Astronaut Phil piloted us safely to Raglan, a surf town just west of Hamilton. 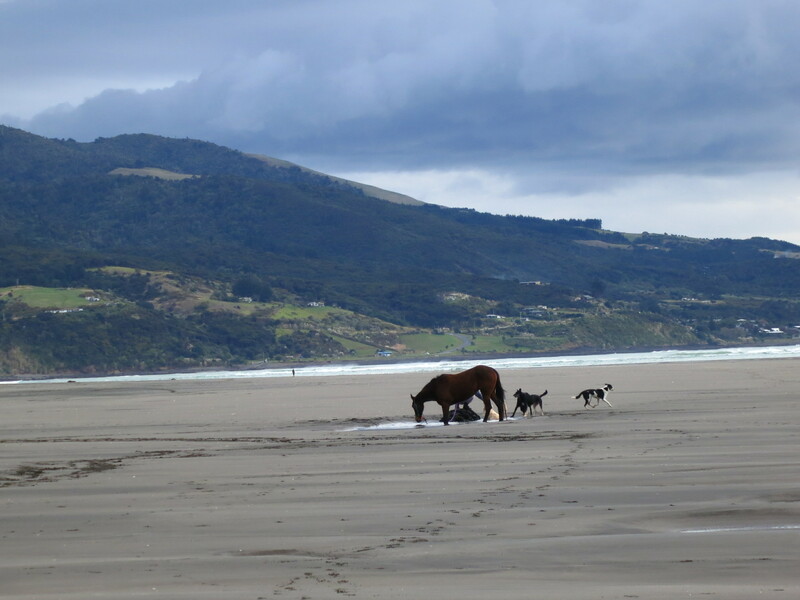 We took a long walk along the black sand beach where we saw a woman training her horse and a rainbow gracing the sky. Of course, often when there is a rainbow, there is rain. Unfortunately, we were about a 45 minute walk from the hostel when it began pouring. We looked like drowned rats when we returned. 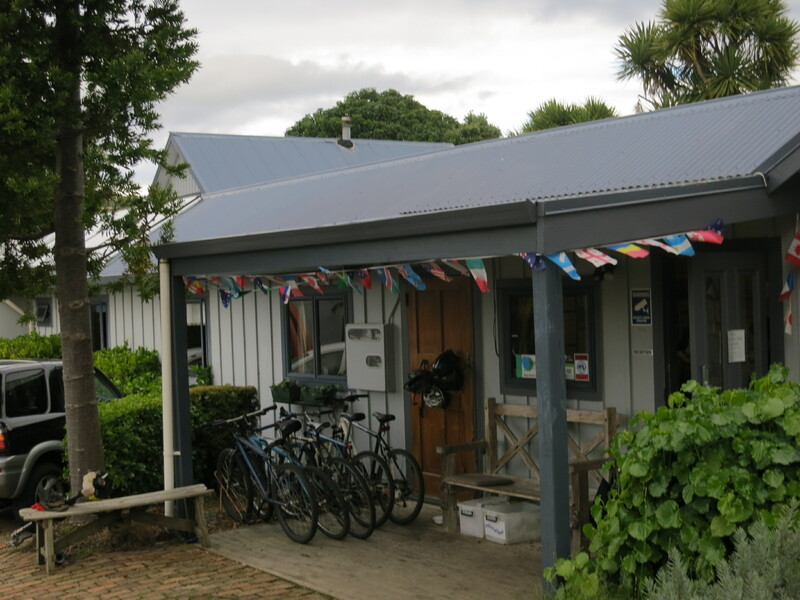 Luckily, Raglan Backpackers is a really nice hostel and they have electric blankets on each bed. Yes, please! We spent the next hour warming up and drying off. We ended our night at the Harbour View Hotel Sports Bar which was packed with locals who came out to cheer on the Hamilton Chiefs in the Super Rugby finals match against the Sharks. We didn’t really know what was happening, but after about 15 minutes, we picked up on the basics and we are smart enough to follow the flow of the crowd. They cheer. We cheer. They boo. We boo. Not too hard. Besides, it doesn’t take any practice wincing at some of the hits they laid on each other. Have you ever seen rugby? Geez, that sport is violent. Now I understand why people think American football is for wimps. Tomorrow we board our Spaceship and continue our journey. It is amazing–everyday we see something new. What will it be tomorrow? I can’t wait to find out! So, we are less than one week from the start of our RTW trip and I have a confession: I’m nervous. It is hard for me to pinpoint exactly why I’m nervous, but I am. I’ve never traveled in this way before—we will be gone for almost four months and much of that time is unplanned. Yes, we have hotels booked for each city we fly into, that way we have a place to go from the airport, but after that who knows what we’ll see and do? That is awesome. That is exactly how we want it to be. However, I think that is also what is causing some trepidation. I think it is inevitable that there will be days when we don’t know where we will be laying our head that night. What happens when it is 9:00 PM and we still don’t have a place to stay? Can I handle that lack of predictability? Will I end up getting upset and will Phil and I end up fighting because of my discomfort with the situation? I imagine when this happens we will end up having to stay in some real fleabag motels or we will end up shelling out too much money and staying in a far nicer place than we planned. Ultimately none of this really matters—no matter what, everything will work out fine, and if it isn’t all smooth sailing, well it will make for a great memory. Intellectually, I know this is true. However, I think I won’t fully understand it until we actually begin our journey and have these types of experiences. Don’t get me wrong, I am so excited for our trip. We have been planning and talking about it for so long and it is finally here! There is just so much that is unknown—I guess it is natural to be a little nervous. Hopefully when I’m drinking my first Steinlager beer in New Zealand, I will take a deep breath, toast to my husband, and my nerves will melt away.